C1678. KLAUS TENNSTEDT Cond. NDR S.O. 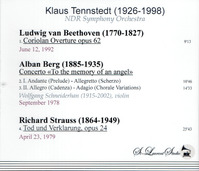 : Coriolan Overture (Beethoven); Tod und Verklärung (Strauss); w. WOLFGANG SCHNEIDERHAN: 'To the Memory of an Angel' Violin Concerto (Berg). [The Berg Concerto’s Bach Chorale variations is ethereal!] (Canada) St Laurent Studio YSL T-767, Live Performances, 1978-92. Transfers by Yves St Laurent. (Canada) St Laurent Studio YSL T-767, Live Performances, 1978-92. Transfers by Yves St Laurent. "Wolfgang Schneiderhan was born on 28 May, 1915 in Vienna as the son of the actor Theodor Schneiderhan, and received his first violin lessons from his mother, the prominent zither virtuoso Emma Schneider-Fallmann. He performed in public for the first time as a child prodigy in 1920. He then studied with Julius Winkler in Vienna, and supplemented his training through studies with Otakar Sevcik in Pisek, as did his brother Walther, who later became concertmaster of the Vienna Symphony. By the end of the 1920s Wolfgang Schneiderhan's international career had begun, which would lead him to important centers of music and festivals worldwide. In addition to this, he developed a very successful orchestral career, becoming concertmaster of the Vienna Symphony in 1933 before taking up the same position with the Vienna State Opera on 1 September, 1937. Shortly thereafter, together with Otto Strasser, Ernst Morawec und Richard Krotschak, he founded the Schneiderhan Quartet, an ensemble which existed until 1951. By then, Wolfgang Schneiderhan had already left the Philharmonic. His solo career was not compatible with work in the orchestra, and despite great efforts on the part of then chairman Rudolf Hanzl, he relinquished his orchestral duties on 31 May, 1949, although in the following years never did he lose contact with the orchestra. Even after parting with the string quartet he did not turn away completely from chamber music activities, as he continued to play piano trio with Edwin Fischer and Enrico Mainardi and violin sonatas with Carl Seemann. 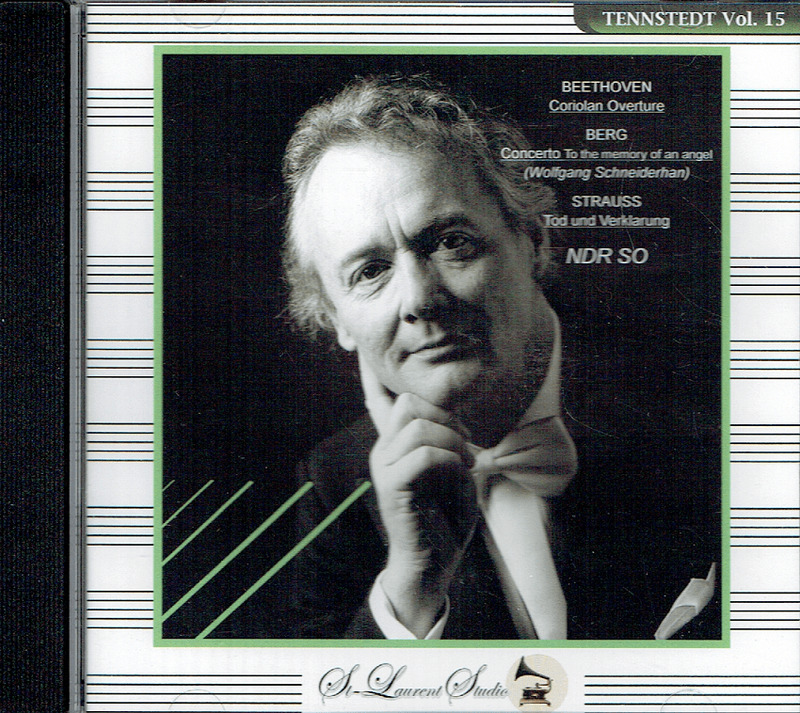 In September 1952 he made his benchmark Deutsche Grammophon recordings of all ten Beethoven violin sonatas with Wilhelm Kempff in the Konzerthaus, Mozartsaal, Vienna. As successor to Georg Kulenkampf he directed master classes in violin at the International Music Festival in Lucerne, an institution which provided him a musical home for many decades. He was co-founder, together with Rudolf Baumgartner, of the renowned Festival Strings Lucerne in 1956. Schneiderhan's professorships at the Salzburg Mozarteum and Vienna College of Music are indicative of his lifelong activities as pedagogue, which he complemented through his endeavors as editor and publisher of numerous classical violin compositions, and articles and lectures pertaining thereto, which continued up until his death. Wolfgang Schneiderhan was concertmaster of the Vienna Philharmonic for only 12 years; he appeared 80 times with the Vienna Philharmonic as soloist. 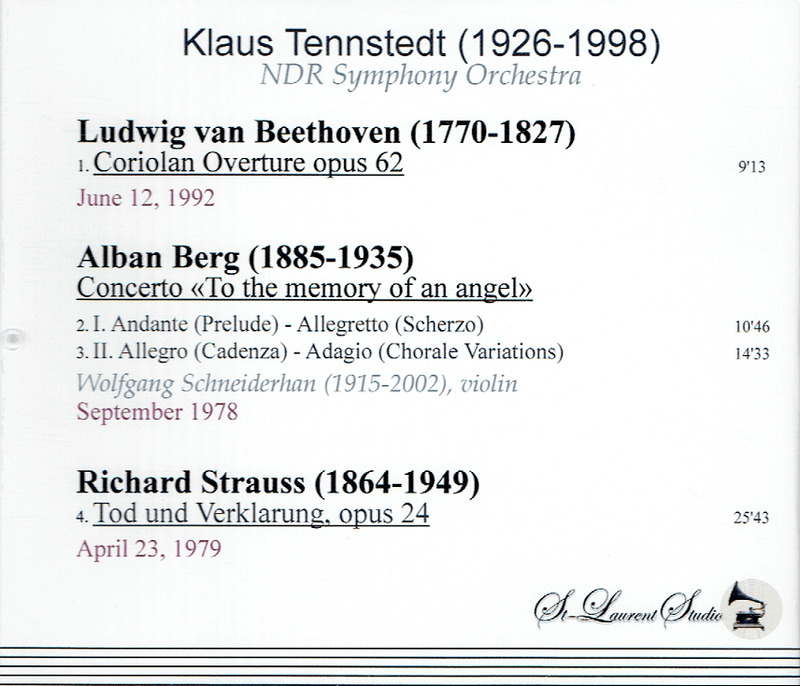 The solo repertoire which he performed with the Philharmonic was predominantly made up of the violin concerti of Bach, Mozart, Beethoven, Brahms, Tchaikovsky and Dvorák, as well as Mozart's Sinfonia concertante, Beethoven's 'Triple' Concerto, violin romances, and the 'Double' Concerto of Brahms. He also performed works by Arcangelo Corelli, Joseph Haydn, Giovanni Battista Viotti, Niccolo Paganini, Felix Mendelssohn Bartholdy, Edward Elgar, Edouard Lalo and Igor Stravinsky. Schneiderhan appeared with his wife, Irmgard Seefried, who sang Mozart's soprano aria 'Non temer, amato bene', KV 490, while he played the violin obbligato. The time span of Schneiderhan's appearances with the Vienna Philharmonic was longer than most musicians' entire professional career. Wolfgang Schneiderhan performed with the most prominent musicians of the 20th century: Géza Anda, Karl Böhm, Edwin Fischer, Pierre Fournier, Ferenc Fricsay, Wilhelm Furtwängler, Gerhart Hetzel, Herbert von Karajan, Istvan Kertész, Hans Knappertsbusch, Clemens Krauss, Richard Krotschak, Enrico Mainardi, Lord Yehudi Menuhin, and Janos Starker. The most prominent admirer of his artistic ability was none other than Richard Strauss, who conducted concertmaster Schneiderhan in both of the legendary concerts on the occasion of the master's 75th and 80th birthdays in 1939 and again in 1944. For Richard Strauss, Wolfgang Schneiderhan was the measure of all things relating to the violin."